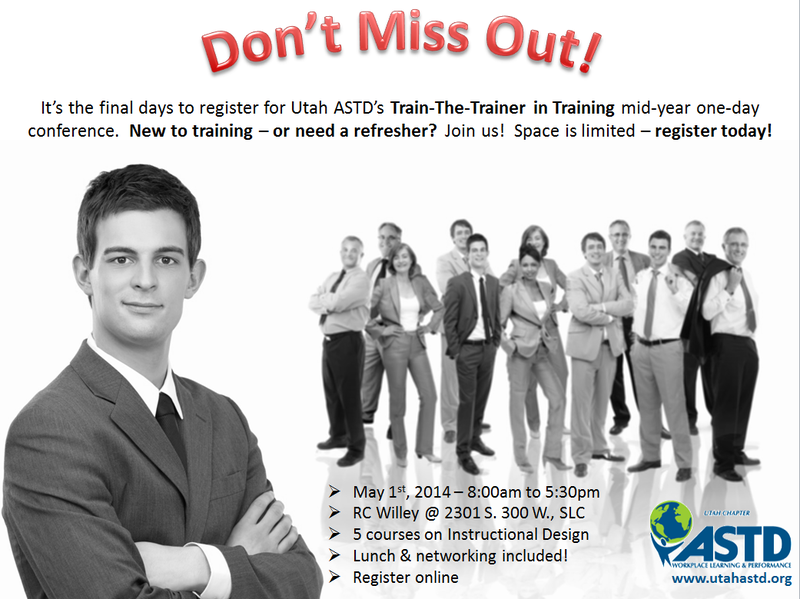 This one-day course on ADDIE/Instructional Design is an expanded version of the training track that we offered at the 2013 Annual Utah L&D Conference that we hosted. The turnout and feedback was so great, we wanted to offer it again and include lunch! (5) Leaving ADDIE for SAM. The presenters are either current/former Utah ASTD Board members or have presented for Utah ASTD before. Though they all come from different industries, all are seasoned learning & development professionals with no less than 10 years of experience in the field each. Sections 1-4 are based on ASTD's Ultimate Train The Trainer in Training book, and section 5 pulls material from another ASTD book, Leaving ADDIE for SAM. Though designed for the facilitator to work through the material, there is a lot of time built in for group discussions and the opportunity for you to learn from, and share with, each other. This class is designed to be both introductory for those new to training, as well as refresh & challenge an experienced trainer/instructional designer. To help drive the material home, all participants will be given a participants guide.